How To Sleep Like A Baby Everywhere You Go? With A Sunyear Camping Hammock, Of Course! Tired of cheaply made hammocks that won’t even last you through a travel year? Fed up with annoying bugs and blood sucking mosquitoes ruining your outdoor sleep? Looking for a multipurpose 2 in 1 camping hammock bed? Search no more! You have just found the ultimate camping gear. Now you can enjoy sleeping under the stars and keep nasty mosquito bites at bay. Set It Up, Lie Down & Enjoy – Camping Life Is Easy & Comfortable Again With Sunyear Equipment! No matter what you do, no matter who you are, no matter where you go, this camping hammock will go everywhere you go you. Fits in your car, backpack or travel suitcase. In less than 5 minutes, you have a sleeping bed or relaxing hammock ready to go. You just need to find 2 trees, use the adjustable straps and carabiners, hang the hammock and enjoy. Ideal for men, women, kids, and pets as well. Perfect for camping, hiking, beach excursions, picnics, backyard fun, music festivals, lake fishing trips, traveling, survival, and so much more! The large and convenient size along with its up to 600lbs support, make this hanging hammock great for more than one person! Why Go For A Sunyear Double Camping Hammock? · … is larger than all the others (118×78”), comfy and ultra-resilient. · … ensures hassle free assembly and storage. · … works as a double lying hammock or sleeping bed! · … has an excellent mosquito net to keep bugs and insects out! · … comes with all the installation tools (carabiners & straps) included. ✓A TRUE 2 PERSON OUTDOOR HAMMOCK: Our mosquito hammock measures 118x78'' ( withstands up to 600lbs), much larger than similar double hammock (their size is 108 x 55")on the market. The lightweight portable double parachute hammock comes in an elegant pouch with all its installation tools. Ideal for solo adventures, camping, hiking, backpacking, travel, emergency. ✓All THE INSTALLATION TOOLS INCLUDED: Our Mosquito Nylon Hammock comes with 2 easy-setup hammock straps(32 adjustment loops +20ft long combined)+2 heavy duty snag free carabiners+2 net ropes at valued more than $22 on Amazon. The best combination not only save your money and time, but also avoid unnecessary waste. ✓ FOR SAFE & SOUND SLEEPS: Love into the wild adventures, camping and backpacking, but hate mosquito bites and pesky bugs? If so, then this camping hammock with net is the answer. Use it as a sleeping bed for at least 2people and protect yourself from insect bites. Flip it over and use it as a relaxing hammock in seconds! 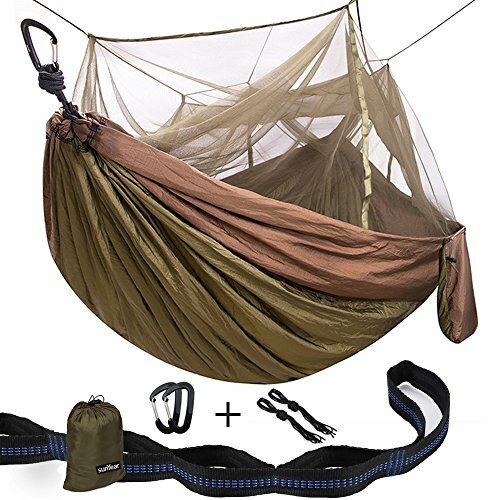 ✓ QUALITY MEETS ENDURANCE: Made of high quality nylon materials and special designed bug net fabric, excellent crafts manship this lightweight portable double parachute hammock is designed to accommodate even your most demanding camping needs. ✓ GET THIS HAMMOCK BED GEAR RISK FREE: Since your satisfaction is our top priority, this portable camping hammock set is backed by our 60-daymoney back guarantee and our 1 year warranty policy. Just in case you happen to have and issues with it. Makes a thoughtful gift to an avid camperfriend or beloved family member who loves outdoor adventures!